Hammurabi[a] (c. 1810 BC – c. 1750 BC) was the sixth king of the First Babylonian Dynasty, reigning from 1792 BC to 1750 BC (according to the Middle Chronology). He was preceded by his father, Sin-Muballit, who abdicated due to failing health. During his reign, he conquered Elam and the city-states of Larsa, Eshnunna, and Mari. He ousted Ishme-Dagan I, the king of Assyria, and forced his son Mut-Ashkur to pay tribute, bringing almost all of Mesopotamia under Babylonian rule. Hammurabi is best known for having issued the Code of Hammurabi, which he claimed to have received from Shamash, the Babylonian god of justice. 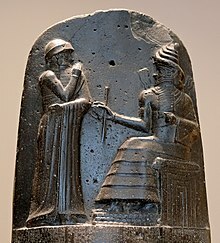 Unlike earlier Sumerian law codes, such as the Code of Ur-Nammu, which had focused on compensating the victim of the crime, the Law of Hammurabi was one of the first law codes to place greater emphasis on the physical punishment of the perpetrator. It prescribed specific penalties for each crime and is among the first codes to establish the presumption of innocence. Although its penalties are extremely harsh by modern standards, they were intended to limit what a wronged person was permitted to do in retribution. The Code of Hammurabi and the Law of Moses in the Torah contain numerous similarities, but these are probably due to shared background and oral tradition, and it is unlikely that Hammurabi's laws exerted any direct impact on the later Mosaic ones. A carving at the top of the stele portrays Hammurabi receiving the laws from Shamash, the Babylonian god of justice, and the preface states that Hammurabi was chosen by Shamash to bring the laws to the people. Parallels between this narrative and the giving of the Covenant Code to Moses by Yahweh atop Mount Sinai in the Biblical Book of Exodus and similarities between the two legal codes suggest a common ancestor in the Semitic background of the two. Nonetheless, fragments of previous law codes have been found and it is unlikely that the Mosaic laws were directly inspired by the Code of Hammurabi. [b] Some scholars have disputed this; David P. Wright argues that the Jewish Covenant Code is "directly, primarily, and throughout" based upon the Laws of Hammurabi. In 2010, a team of archaeologists from Hebrew University discovered a cuneiform tablet dating to the eighteenth or seventeenth century BC at Hazor in Israel containing laws clearly derived from the Code of Hammurabi. I am the battle net that catches him who offends me. In the late nineteenth century, the Code of Hammurabi became a major center of debate in the heated Babel und Bibel ("Babylon and Bible") controversy in Germany over the relationship between the Bible and ancient Babylonian texts. In January 1902, the German Assyriologist Friedrich Delitzsch gave a lecture at the Sing-Akademie zu Berlin in front of the Kaiser and his wife, in which he argued that the Mosaic Laws of the Old Testament were directly copied off the Code of Hammurabi. Delitzsch's lecture was so controversial that, by September 1903, he had managed to collect 1,350 short articles from newspapers and journals, over 300 longer ones, and twenty-eight pamphlets, all written in response to this lecture, as well as the preceding one about the Flood story in the Epic of Gilgamesh. These articles were overwhelmingly critical of Delitzsch, though a few were sympathetic. The Kaiser distanced himself from Delitzsch and his radical views and, in fall of 1904, Delitzsch was forced to give his third lecture in Cologne and Frankfurt am Main rather than in Berlin. The putative relationship between the Mosaic Law and the Code of Hammurabi later became a major part of Delitzsch's argument in his 1920-21 book Die große Täuschung (The Great Deception) that the Hebrew Bible was irredeemably contaminated by Babylonian influence and that only by eliminating the human Old Testament entirely could Christians finally believe in the true, Aryan message of the New Testament. 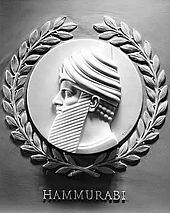 In the early twentieth century, many scholars believed that Hammurabi was Amraphel, the King of Shinar in the Book of Genesis 14:1. This view has now been largely rejected, and Amraphael's existence is not attested in any writings from outside the Bible. Because of Hammurabi's reputation as a lawgiver, his depiction can be found in several U.S. government buildings. Hammurabi is one of the 23 lawgivers depicted in marble bas-reliefs in the chamber of the U.S. House of Representatives in the United States Capitol. A frieze by Adolph Weinman depicting the "great lawgivers of history", including Hammurabi, is on the south wall of the U.S. Supreme Court building. 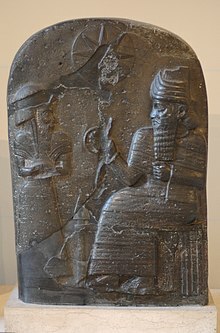 At the time of Saddam Hussein, the Iraqi Army's 1st Hammurabi Armoured Division was named after the ancient king as part of an effort to emphasize the connection between modern Iraq and the pre-Arab Mesopotamian cultures. Richardson, M.E.J. (2000). Hammurabi's laws : text, translation and glossary. Sheffield: Sheffield Acad. Press. ISBN 978-1-84127-030-2. Saggs, H.W.F. (1988). The greatness that was Babylon : a survey of the ancient civilization of the Tigris-Euphrates Valley. London: Sidgwick & Jackson. ISBN 978-0-283-99623-8. Yoffee, Norman (1977). The economic role of the crown in the old Babylonian period. Malibu, CA: Undena Publications. ISBN 978-0-89003-021-9. ^ /ˌhæmʊˈrɑːbi/; Akkadian: 𒄩𒄠𒈬𒊏𒁉 Ḫa-am-mu-ra-bi, from the Amorite ʻAmmurāpi ("the kinsman is a healer"), itself from ʻAmmu ("paternal kinsman") and Rāpi ("healer"). 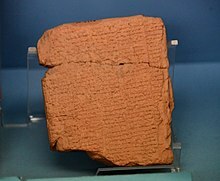 ^ Barton, a former professor of Semitic languages at the University of Pennsylvania, stated that while there are similarities between the two texts, a study of the entirety of both laws "convinces the student that the laws of the Old Testament are in no essential way dependent upon the Babylonian laws." He states that "such resemblances" arose from "a similarity of antecedents and of general intellectual outlook" between the two cultures, but that "the striking differences show that there was no direct borrowing." ^ Beck, Roger B.; Black, Linda; Krieger, Larry S.; Naylor, Phillip C.; Shabaka, Dahia Ibo (1999). World History: Patterns of Interaction. Evanston, IL: McDougal Littell. ISBN 978-0-395-87274-1. OCLC 39762695. ^ Claire, Iselin. "Royal head, known as the "Head of Hammurabi"". Musée du Louvre. ^ Clay, Albert Tobias (1919). The Empire of the Amorites. Yale University Press. p. 97. ^ a b c Davies, W. W. (January 2003). Codes of Hammurabi and Moses. Kessinger Publishing. ISBN 978-0-7661-3124-8. OCLC 227972329. ^ a b c d e Bertman, Stephen (2003). Handbook to Life in Ancient Mesopotamia. Oxford, England: Oxford University Press. p. 71. ISBN 978-019-518364-1. ^ Prince, J. Dyneley (1904). "The Code of Hammurabi". The American Journal of Theology. 8 (3): 601–609. JSTOR 3153895. ^ Kleiner, Fred S. (2010). Gardner's Art through the Ages: The Western Perspective. 1 (Thirteenth ed.). Boston, Massachusetts: Wadsworth Cengage Learning. p. 29. ISBN 978-0-495-57360-9. ^ Smith, J. M. Powis (2005). The Origin and History of Hebrew Law. Clark, New Jersey: The Lawbook Exchange, Ltd. p. 13. ISBN 978-1-58477-489-1. ^ a b Douglas, J. D.; Tenney, Merrill C. (2011). Zondervan Illustrated Bible Dictionary. Grand Rapids, Michigan: Zondervan. p. 1323. ISBN 978-0310229834. ^ a b c Barton, G.A: Archaeology and the Bible. University of Michigan Library, 2009, p.406. ^ Wright, David P. (2009). Inventing God's Law: How the Covenant Code of the Bible Used and Revised the Laws of Hammurabi. Oxford, England: Oxford University Press. pp. 3 and passim. ^ "Tablet Discovered by Hebrew U Matches Code of Hammurabi". Beit El: HolyLand Holdings, Ltd. Arutz Sheva. 26 June 2010. ^ a b Van De Mieroop 2005, p. 128. ^ a b c Van De Mieroop 2005, p. 127. ^ a b Van De Mieroop 2005, p. 126. ^ a b Van De Mieroop 2005, pp. 126–127. ^ a b c Van De Mieroop 2005, p. 129. ^ a b Van De Mieroop 2005, pp. 129–130. ^ Van De Mieroop 2005, p. 130. ^ a b Ziolkowski 2012, p. 25. ^ a b Ziolkowski 2012, pp. 23–25. ^ "Bible Gateway passage: Genesis 14 - New International Version". ^ North, Robert (1993). "Abraham". In Metzger, Bruce M.; Coogan, Michael D. The Oxford Companion to the Bible. Oxford, England: Oxford University Press. p. 5. ISBN 978-0-19-504645-8. ^ a b Granerød, Gard (26 March 2010). Abraham and Melchizedek: Scribal Activity of Second Temple Times in Genesis 14 and Psalm 110. Berlin, Germany: Walter de Gruyter. p. 120. ISBN 978-3-11-022346-0. ^ "Hammurabi". Architect of the Capitol. Retrieved 19 May 2008. ^ "Courtroom Friezes" (PDF). Supreme Court of the United States. Archived from the original (PDF) on 1 June 2010. Retrieved 19 May 2008. ^ Biskupic, Joan (11 March 1998). "LAWGIVERS: FROM TWO FRIEZES, GREAT FIGURES OF LEGAL HISTORY GAZE UPON THE SUPREME COURT BENCH". WP Company LLC. The Washington Post. Retrieved 28 November 2017. Arnold, Bill T. (2005). 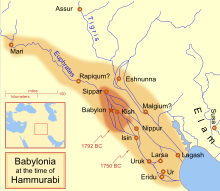 Who Were the Babylonians?. Brill Publishers. ISBN 978-90-04-13071-5. OCLC 225281611. Breasted, James Henry (2003). Ancient Time or a History of the Early World, Part 1. Kessinger Publishing. ISBN 978-0-7661-4946-5. OCLC 69651827. DeBlois, Lukas (1997). An Introduction to the Ancient World. Routledge. ISBN 978-0-415-12773-8. OCLC 231710353. Van De Mieroop, Marc (2005). King Hammurabi of Babylon: A Biography. Blackwell Publishing. ISBN 978-1-4051-2660-1. OCLC 255676990.